Simple acts of kindness can make a huge difference. 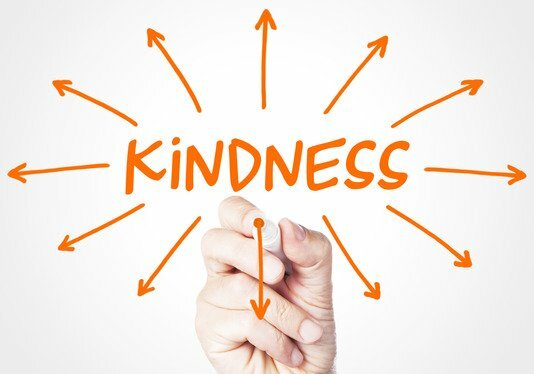 Holding a door, sharing your lunch, offering your spot in line, taking the cart back into the store and keeping someone company till the ambulance or locksmith arrives are ways to demonstrate kindness to someone in need. Not gonna lie though, kindness can be inconvenient. Being a listening ear or returning a lost wallet can be time consuming. And, kindness takes courage. Sometimes the kindest thing you can do is put down a suffering dog, or help pack up your best friend to move away from you. I assure you the benefits outweigh the loss. Scientific studies show that being kind is a healthy response to almost every situation. All Kindness requires is an intentional action. Decide in advance to be a kind person. Then start to practice intentional kindness. Mention a job well done. Smile at strangers and smile at your family. Always use please and thank you. I’m sure there a million more ways that you can think of, so exercise your creative juices and choose kindness today … and tomorrow … and the day after that … and the day after that … and the day after that. Kindness potentiates the love of God to a world of hurting and broken people. It will change you, it will change your recipient. I’d love to hear about the last time you were shown kindness. Leave a comment below with your best idea for kindness.